Many difficult challenges confront today′s interior design professional. To compete successfully in the marketplace of the nineties, designers need a sophisticated business strategy, legal knowledge, and the ability to deal with clients, vendors, and other design professionals. 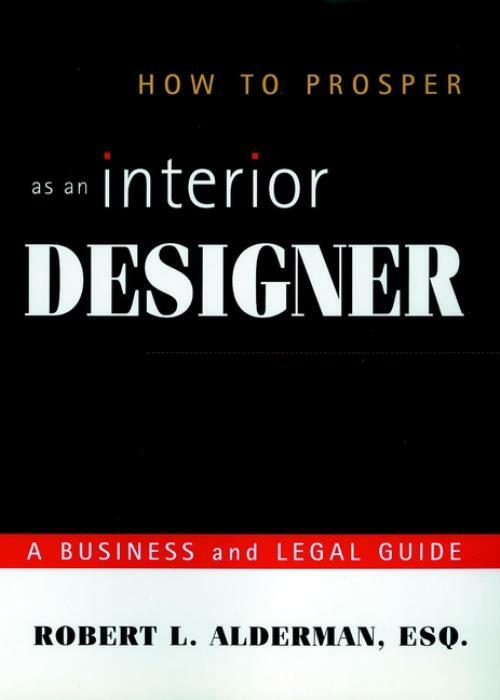 How to Prosper as an Interior Designer provides that guidance in a unique, practical book. It has been fifteen years since Robert L. Alderman, Esq., wrote his classic, How to Make More Money at Interior Design the book that helped a generation of designers to manage successful practices. Since then, the profession has been subjected to momentous changes. Designers have persevered through the boom and bust of the eighties, the upsurge of the nineties, the emergence of "mega firms," and greater specialization within the field. Robert Alderman′s new book, How to Prosper as an Interior Designer, provides detailed guidance for all designers seeking to succeed in today′s competitive environment. It will help educate newcomers, reassure seasoned professionals, and equip a tough new breed of designer–entrepreneurs to thrive under any market conditions. Drawing upon his legal and financial experience as an attorney and financial adviser in the interior design field, Robert Alderman offers advice on many crucial legal and business issues to those who operate commercial or residential practices. He helps design professionals make informed decisions about proposals and contracts, letters of agreement, charging clients, budgeting, financial management, working with architects and contractors, legal liability, purchases and deliveries, and more. Employing similar techniques from his previous bestseller, Mr. Alderman uses real–life case studies to show designers how to cope with their daily problems of cost overruns, contract disputes, fraudulent contractors, and difficult clients. These practical case studies show firsthand how other designers react when a crisis occurs an invaluable source of learning by example. Preparing a Letter of Agreement. Preparing a Letter of Agreement for Commercial Projects. Designer Responsibility and Client Budget: Designer Divorce and Client Continuity. Professional Analysis for Charging Clients. Preparing a Residential Design Proposal. Preparing a Contract or Commercial Design Proposal. Financial Management and Protection for Residential Designers. Designers and Industry––Expectations and Ramifications. Creativity and Confusion: Why Designers Don′t Make Money. ROBERT L. ALDERMAN, Esq., is an attorney licensed to practice in New York and Florida. He teaches continuing education courses for the American Society of Interior Designers and the state of Florida, and has lectured nationwide for design organizations and design centers. His bestselling book, How to Make More Money at Interior Design, was published in the 1980s. Mr. Alderman has also produced a library of lectures on audiocassette, entitled How to Make More Money at Interior Design, and for many years wrote magazine columns for Interior Design and The Designer. A former trial counsel for the United States Securities and Exchange Commission, Mr. Alderman received an MBA in finance and a law degree from Syracuse University after completing his undergraduate work at Cornell University.